2014 Clean up Project Excellence Award - Parson Brinckerhoff for "Sustainable Treatment Using C3TM Refridgerated Condensation"
In this remediation project contaminated off-gas from a soil vapour extraction (SVE) system was treated with C3™ refrigerated condensation at the Huntsman Chemical Company Australia Pty Limited (HCCA) former chemical manufacturing facility, Victoria. The remediation approach has proven to be an innovative, efficient and sustainable method for treating VOCs in off-gas vapour streams. HCCA implemented this new technology proposed by Parsons Brinckerhoff to treat LNAPL, groundwater and vadose VOC impacts in a defined area of the Site because the evidence from overseas was that the technology could achieve treatment objectives in a much shorter timeframe, and hence at less cost and lower environmental impact, than alternative more commonly applied treatment strategies. Groundwater at the HCCA Site is 8-9 m below ground level. Annual monitoring of groundwater condition indicates the presence of a stable plume of contamination extending across the Site and off-site some 350 m to the south. The main contaminant of concern in the plume is benzene. The C3™ technology is not limited by VOC concentration; it can operate above lower explosive limit (LEL) concentrations in the off-gas stream. The C3™ technology is capable of up to 99.9% removal of contaminants from the off-gas stream. C3™ refrigerated condensation removed the need for supplementary fuel or power for on-site thermal/electric destruction of contaminants, and required no water. Within the plume area, shallow aquifer LNAPL and vadose zone impacts were identified within a specific area in the middle of the HCCA Site. The LNAPL covers an area of approximately 50 x 50 m, varying in apparent thickness from 5-63 cm. Dominant contaminants of concern in the LNAPL were isopropyl benzene, alpha methyl styrene, cyclohexane and benzene. Previous treatment trials at HCCA identified that soil vapour extraction (SVE) combined with limited air sparge (AS) was effective at the Site. The treatment approach used vapour extraction (SVE) wells screened across the water table in combination with limited air sparge (AS) to recover contaminants from the sub-surface, and refrigerated condensation for recovering VOCs from the off-gas stream. C3™ refrigerated condensation is a proprietary technology developed by the US-based GEO Environmental Remediation Company (GEO) and supplied in Australia by Environmental Remediation Resources (ERR). 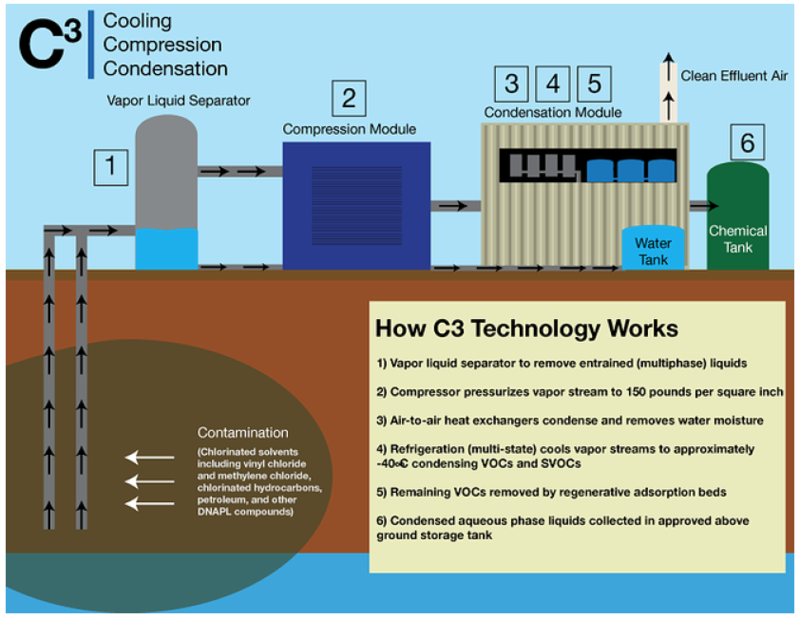 The C3™ technology involves three steps to remove VOCs from the vapour phase; compression, cooling and condensation. A process flow diagram for the C3 technology is shown in Figure 1. The C3™ process may be summarised in the six steps shown in Figure 2 below. From the recovery tank, recovered (condensed) VOCs may either be reused on-site, or drummed off for off-site recycling or energy recovery. Operation of the C3™ technology achieved recovery of more than 5,200 L of recovered (condensed) VOCs over a 12-month treatment period before LNAPL had been removed to the extent practicable, i.e. <5 cm in a single well and 0-0.1 cm LNAPL in other wells. 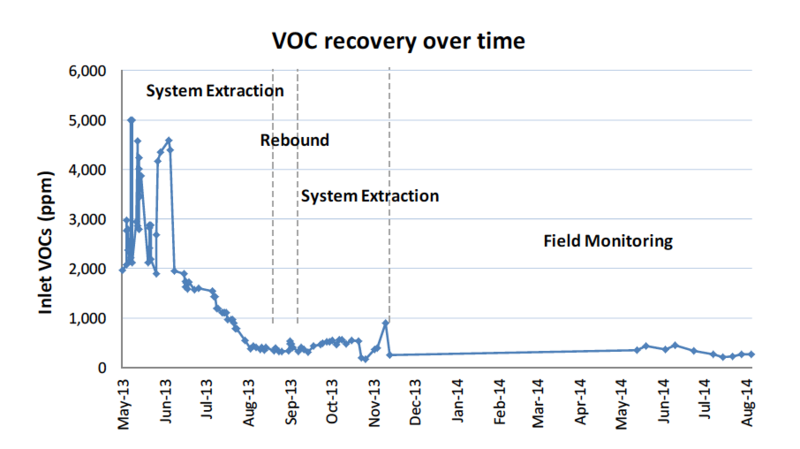 A 12-month “time-to-complete” for treating a LNAPL source in which 5.2 tonnes of condensed VOCs were recovered via the C3™ refrigerated condensation system compares very effectively with traditional thermal or GAC approaches. The advantage of the C3™ technology over alternative approaches is that it is not limited by the concentrations of VOCs and is therefore capable of substantially reducing treatment times compared to traditional treatment systems that require dilution to achieve destruction efficiencies. Treatment time compared to soil vapour extraction or multiphase extraction combined with GAC or thermal/electrical destruction is shown below (Figure 3). 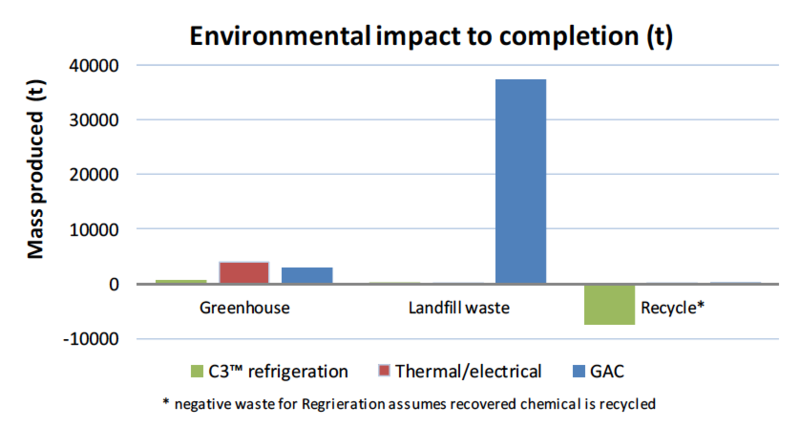 The environmental footprint for C3™ refrigerated condensation was significantly less than alternative treatment systems (see Figure 4 below). In all aspects, i.e. greenhouse emissions (specifically electrical and gas use), waste management/disposal (landfill) and recycle/reuse, the C3™ technology has an advantage. A further advantage is that it did not require any water. The C3™ technology allows for reuse, recycling or energy recovery of recovered (condensed) VOCs that were previously deemed to be a waste. 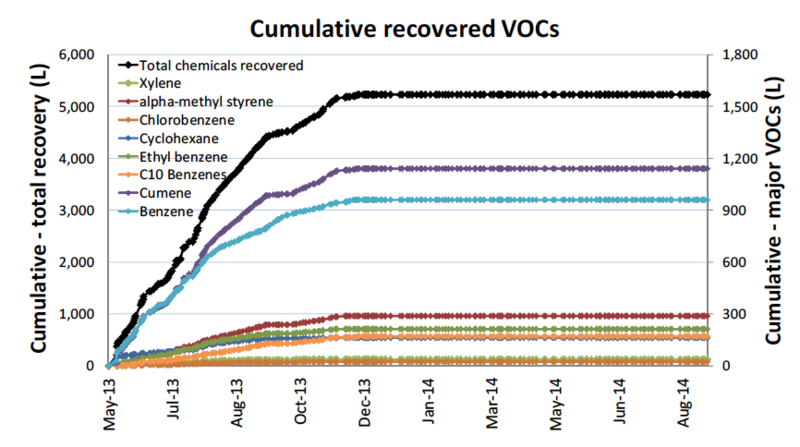 The recovered (condensed) VOCs (see Figure 5) from the HCCA Site could have been reused on-site if chemical manufacturing was still present. 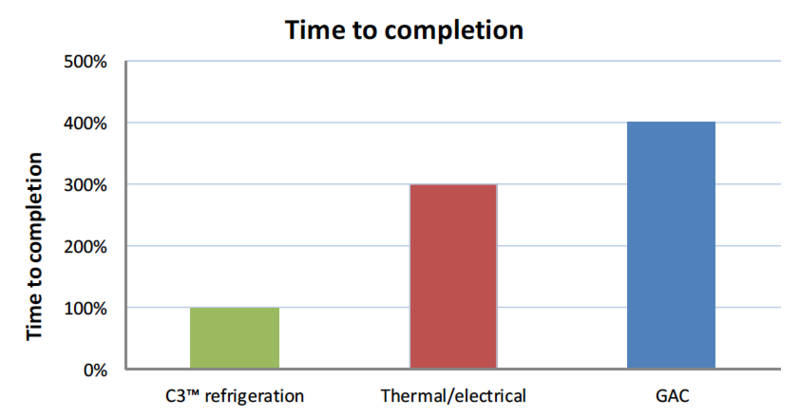 Leasing of the C3™ refrigerated condensation equipment, and a guaranteed up-time of >90%, increased confidence in the commercial viability of the approach versus alternatives (refer Figure 6 below). Prior to commencing the project HCCA consulted with its Community Liaison Committee (CLC), comprising community, local Council and the Victorian EPA, on its plans and received full support for the treatment. Quarterly updates were provided to the CLC throughout the treatment. 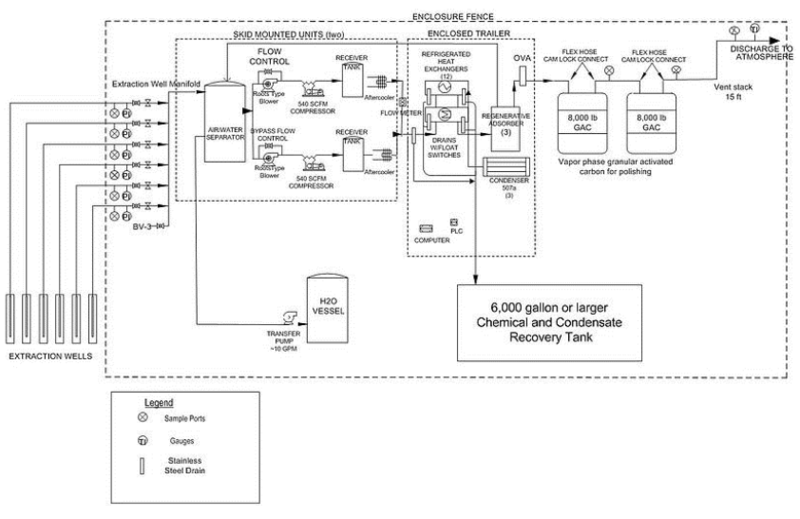 The treatment system recovered over 5,200 L of chemicals over the 12-month period until asymptote and diminishing returns were evident (see Figure 7 below). 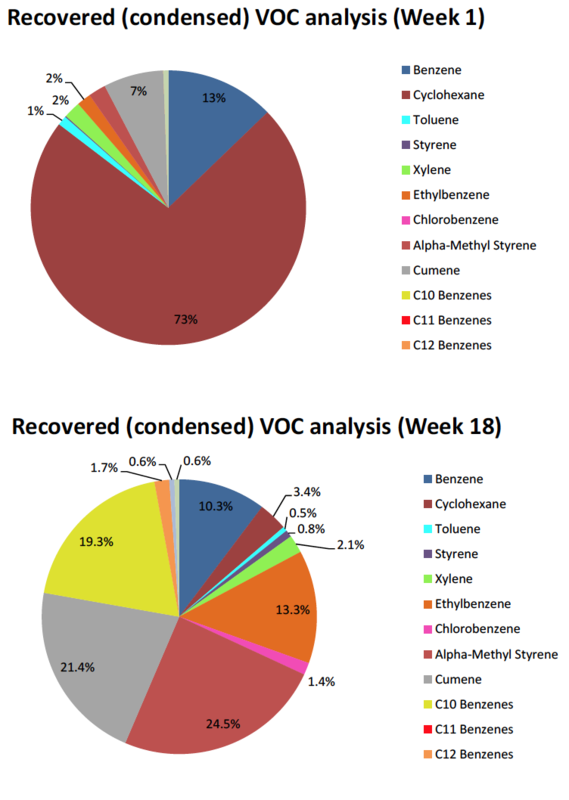 The main recovered (condensed) VOCs were cumene (iso-propyl benzene), benzene, alphamethylstyrene, ethyl benzene and cyclohexane, though the system successfully treated a wide range of compounds. (see Figure 8). In operation, and somewhat surprisingly, the C3™ technology recovered significant quantities of “light end” compounds (e.g. cyclohexane) in the first month of operation after which the proportion of heavier compounds increased steadily (see Figure 9). 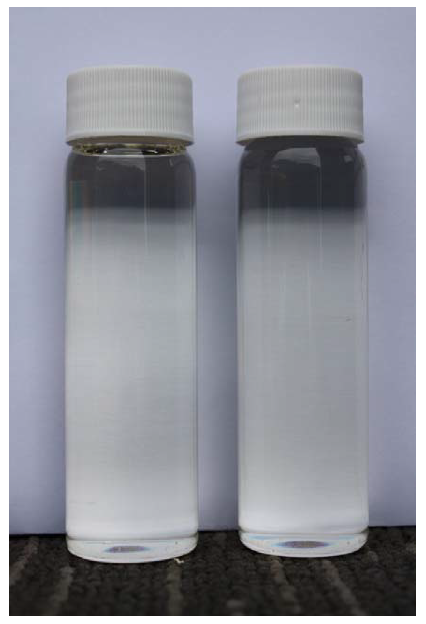 These lighter compounds (C5 and C6) are typically very difficult to capture using some traditional treatment technologies based on GAC (though successfully treated with thermal approaches). Also surprising was that the composition of VOCs after the first month of operation did not clearly match the ratio of compounds in the LNAPL and/or underlying groundwater. Benzene concentrations in the SVE off-gas and recovered VOC for example were much lower than expected from groundwater data, and concentrations of alpha-methyl styrene and cumene (isopropyl benzene). 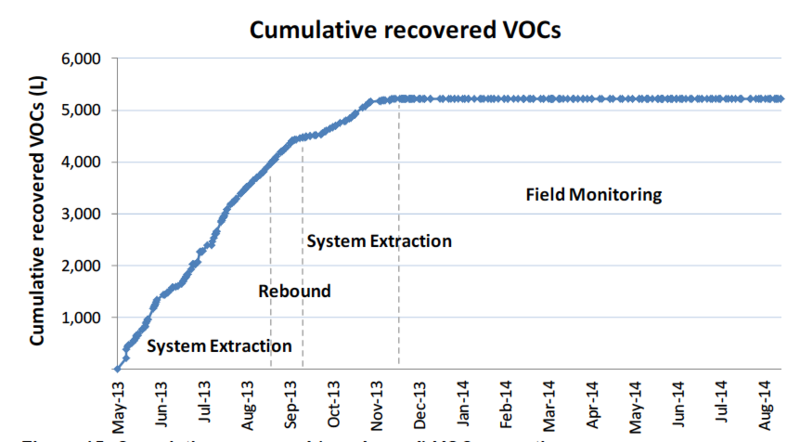 The majority of the recovered (condensed) VOCs (4,500 L) occurred during the initial 4-month treatment phase. Following a rebound period a further 700 L was recovered (see Figure 11 below). Across the majority of the treatment area, LNAPL has now been reduced <5 cm in a single well and 0-0.1 cm LNAPL in other wells and VOCs have been reduced to asymptote. Extraction of VOCs continued on “pulsed” operation during the “rebound” period until it was clear further operation was providing diminishing returns at which time treatment was considered to be to the extent practicable for this technology in this area of the HCCA Site. The C3™ refrigerated condensation technology was proven to be an innovative, efficient and a sustainable method for treating VOCs in off-gas vapour streams at the former HCCA chemical manufacturing facility when compared to other treatment technologies (soil vapour extraction or multiphase extraction combined with granulated activated carbon or thermal/electrical destruction). A further advantage of the C3™ technology is that it is able to convert a hazardous waste into a potential resource. Parsons Brinckerhoff thanks HCCA for accepting our proposal to use a new technology, and for GEO and ERR for providing and supporting the technology. Thanks also to the HCCA's environmental auditor, the Victorian EPA, local council and community for their support.